Optimum Nutrition (ON) has released a new pre workout supplement called “Platinum PRE-“ that I was able to get my hands on for a review. Optimum Nutrition is one of the best supplement companies out there with some very popular products, including one of my favorites Amino Energy. This newer Platinum PRE- is similar to Amino Energy, but is a little stronger and is a step up from Amino Energy pre workout. Platinum PRE- (which I may refer to as PRE for short) is relatively new, being released closer to the end of 2012. Below I am going to go over some of the ingredients found in Platinum PRE-, how I personally liked the supplement (including the taste), any side effects, and anything else I can think of that someone would be interested to know about this supplement. What does Platinum PRE- do? 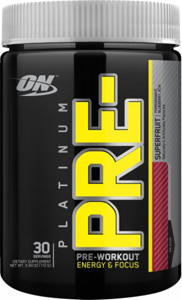 Platinum PRE- is a pre workout supplement, meaning you are supposed to take this before a workout. 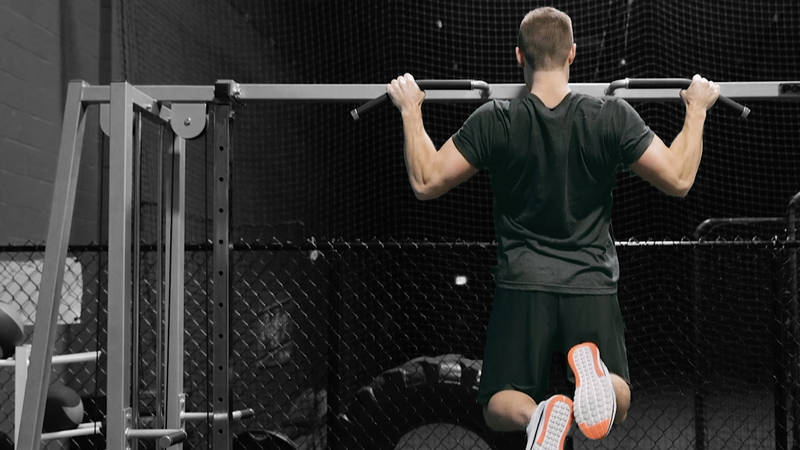 It is going to help you increase your energy levels, improve your focus, and bang out more reps during your workouts – which will lead to you meeting your goals in the gym quicker. The first ingredient found in PRE- is L-Citrulline, a non-essential amino acid, which has been shown to increase performance in the gym by delaying fatigue. This ties right in with the next ingredient which is another popular ingredient found in pre workout supplements these days – Beta-Alanine. Beta-Alanine is another amino acid that has been proven to help support longer and harder workouts. These two supplements will basically help you pump out a few more reps throughout your workout. Instead of being able to lift 225 10 times on your bench press set you may be able to get 11 or 12 reps. Over the course of a workout and the duration of using the supplement those extra reps will really help. Next is the caffeine. 2 scoops of PRE- contains 400 mg of caffeine, which is why later on you will see I’m going to recommend starting with just one scoop. Caffeine will increase your mental focus and help you work harder in the gym. I’ve found 200 mg to be enough for me in a pre workout, but I know some people have built up a tolerance and need more caffeine. To finish off the Platinum PRE- supplement is their Phytoblend and Vitamin C. This includes Beat Juice Powder, Grape Seed Extract, Citrus Bioflavonoids and a powerful dose of vitamin C. These ingredients will all provide antioxidant support, and I thought it was great to see these ingredients included in this pre workout. I get my antioxidant support every morning with my PhytoBerry shake, but I know not everyone will take that so this would be a cheaper alternative included right into your pre workout. How does Platinum PRE- Taste? I’ve only tried their Fruit Punch flavor, but I can say I really enjoyed the flavor and taste. Like a lot of pre workout supplements these days, PRE- almost tasted like a really good fruit juice that you would think is full of sugars (but of course it isn’t). I look forward to drinking any supplement shake that tastes like PRE- does, and overall give it a 9/10 for taste. There was one downside that I will talk about next. Are there any side effects with PRE-? Continuing on from the taste, there was one downside I noticed. When drinking the last little bit of PRE- I ended up getting a burning sensation in my throat. I’m not sure what ingredient causes the burn, but my guess is the Capsicum, which comes from chili peppers. ON claims that the ingredient doesn’t interfere with the fruit flavor, but that’s just my guess of what was causing the burn. It wasn’t a huge negative side effect and I didn’t really care much, but it also wasn’t very pleasant. Other then that the only negative side effects I could think of would if it is too high of a caffeine dose for you it might give you some shakes and overall not feel too good. That is why I recommend starting with 1 scoop, instead of the 2 scoops which is really intense. Lastly the beta-alanine is known to give you a tingling feeling, although I didn’t notice that because my body is used to the beta-alanine. Overall How Did I like Platinum PRE-? To be honest I loved it. Today was my first day trying it out but from my first experience I rate it a 9.5/10. It is Monday and I had a hockey tournament over the weekend, which included a bunch of beers with the guys Saturday. Today I still wasn’t feeling 100% and wasn’t looking forward to my workout. I took 1 scoop or PRE- and headed for the gym. By the time I got there I felt great and ready for a workout. Even though I hadn’t been in the gym since Friday I ended up having a great workout, banging out more reps than usual on most exercises. I felt very focused on my workout, energized throughout, and strong. This pre workout supplement didn’t do too much as far as a “pump”, but it was great for energy, focus, and intensity. I highly recommend you check it out at www.BodyBuilding.com. HI! Thanks for this good review, do you think would be any good to mix (without exaggerate) this product together with amino energy as a super pre-workout shake? I wouldn’t recommend that at all as you will be taking a ton of stimulants.